217 ✉ Bavaria - interesting lot from covers and cards from the Kreuzer and Pfennig period packed in a carton. Thereby many interesting examples, different frankings and cancellations, much legitimate postage and so on. Treasure trove! 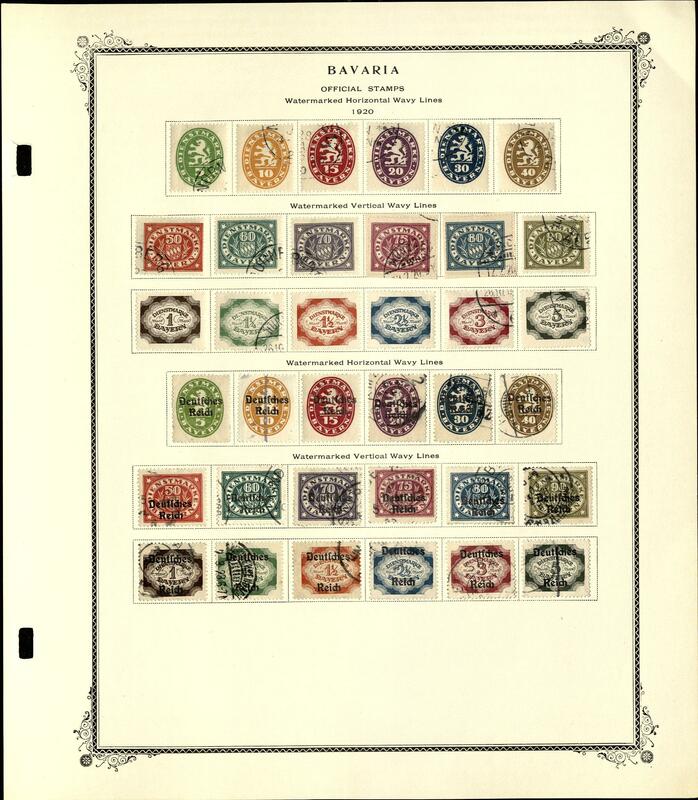 221 ✉ Bavaria - extensive lot of pre philately letters and without prepaid postage offical letters packed in a carton. Many nice documents, practically going through in outstanding condition, with many beautiful cancellations, also mixed postmark types and so on. Including an abundant part Amberg, as well also Regensburg, Sulzbach and so on. A delightful lot! 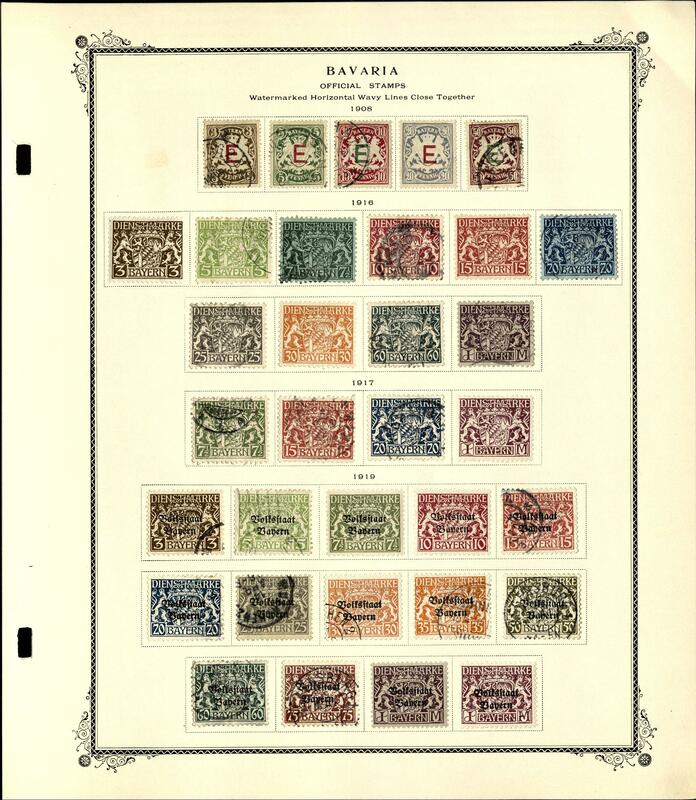 224 Kart⊙n Bavaria - interesting and extensive inventory packed in a carton, as well numerous issues on stock cards with many values the Kreuzer and Pfennig period, with also 18 Kreuzer values and so on. Extensive treasure trove! 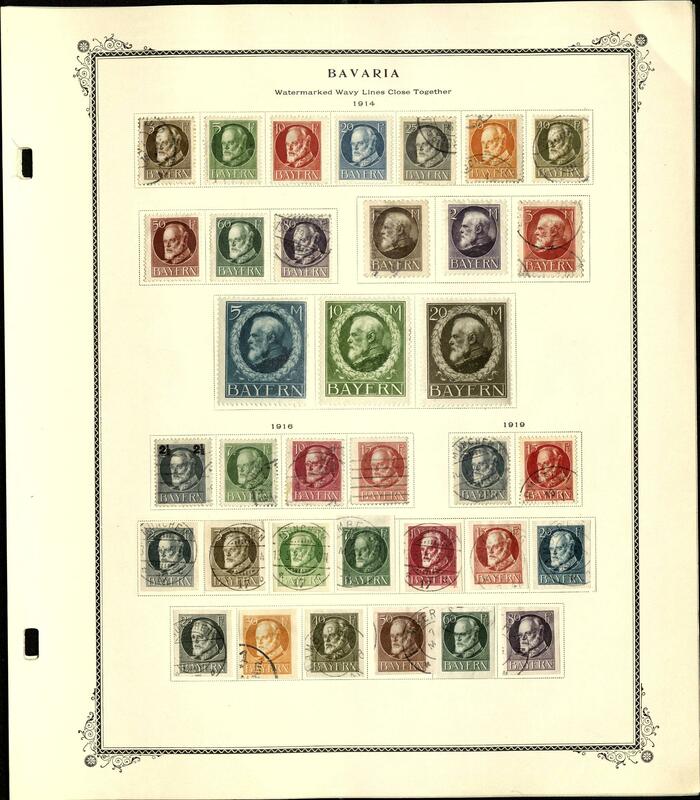 290 /⊙/ Bavaria - 1849 / 1920, nice and rich collection in the spring back binder on lighthouse hingeless preprinted pages, in total in wide above average condition with numerous superb in every respect (choice copy) and pieces in outstanding quality. With also better values of the Kreuzer period including 12 Kr. And 18 Kr. Coat of arms cut, further coat of arms values perforated from of the Kreuzer period, as well a strong part Pfennig period with a lot of better issues, complete sets, airmail stamp 1912 and subsequent service- and postage due stamps including better issues. A magnificent object! 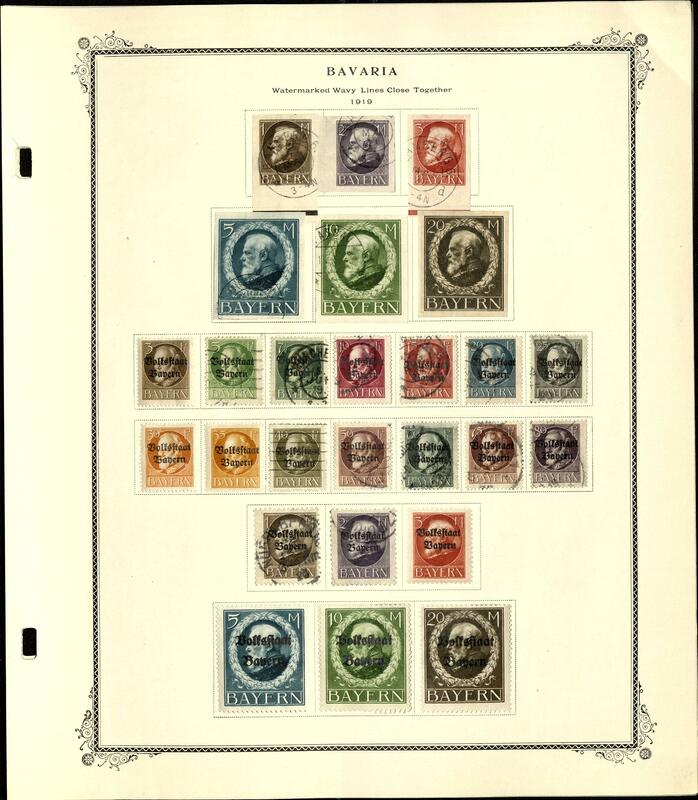 310 ⊙/ Bavaria - 1879 / 1920, rich collection in the spring back binder on lighthouse pages formed with plenty of better issues, mixed quality, with superb and extremely fine copies. As well the Kreuzer period with better values as for instance 12 Kr. Green, 18 Kr. Red, coat of arms stamps, as well an extensive part Pfennig period including complete issues and subsequent service- and postage due stamps. Very high catalog value! 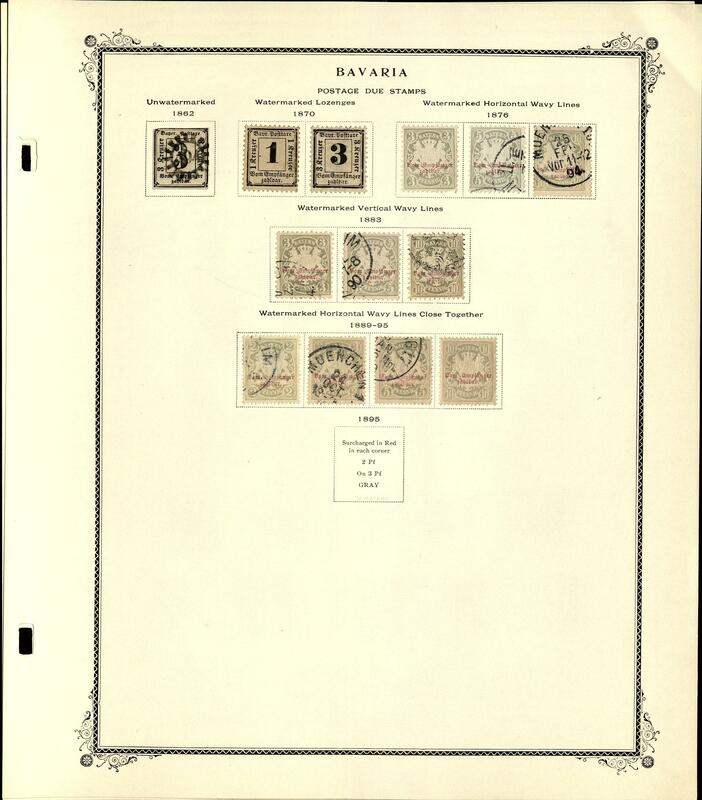 366 ⊙/ / Bavaria - very interesting and extensive inventory in five large stock books accommodated with enormous amount of material, mixed quality, with numerous superb and extremely fine copies. Thereby also very extensive part Kreuzer period with quadrate issues and coat of arms stamps including better values, as well the Pfennig period very abundant be present. Extensive object this favorite area with very high catalogue value! 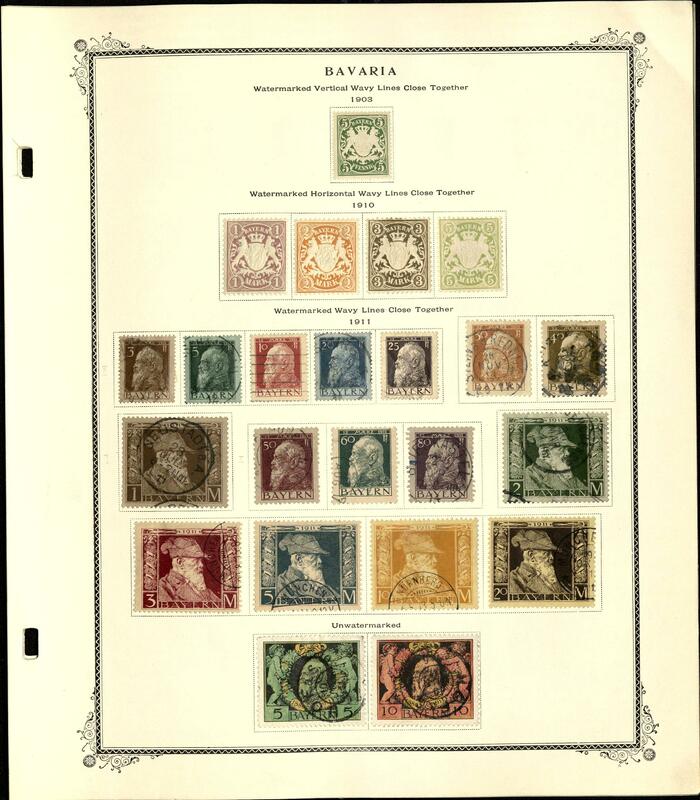 837 /⊙ 4I Bavaria - 1879 / 1920, nice and rich collection in the lighthouse hingeless illustrated album with useful issues, mainly in good condition with many superb and extremely fine copies. With also an interesting part Kreuzer period including 6 Kr. In type I with number postmark \"260\" (Michel no. 4 I) on all sides with very wide margins, 12 Kr. Red cancellation in perfect condition expertized Pfenniger, 18 Kr. Yellow used in perfect condition expertized Pfenniger, 12 Kr. Green used, 18 Kr. Red cancellation, coat of arms stamps, as well the Pfennig period with numerous mint never hinged issues including complete sets, as well service- and postage due stamps. A beautiful object! 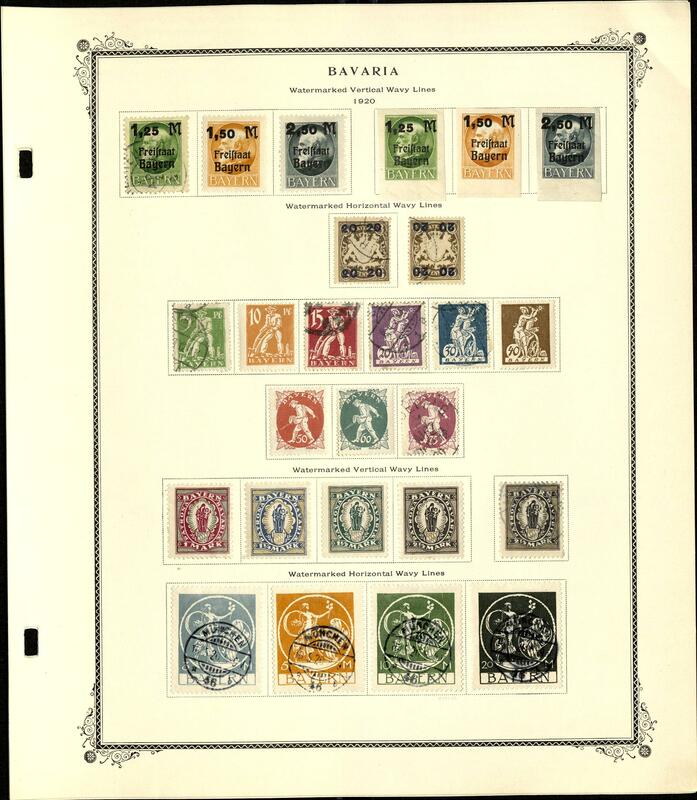 1231 ⊙/ Bavaria - interesting collection with issues the Kreuzer and Pfennig period on Borek preprinted pages formed, mixed quality, with numerous superb and extremely fine copies. As well the Kreuzer period outstanding occupies including the rarely Black One with postmark \"Nuremberg\", 12 Kr. Red, 18 Kr. Yellow, 12 Kr. Green, 18 Kr. Red, the coat of arms stamps including 12 Kr. And 18 Kr. Cut, as well further better issues, including Pfennig period with complete sets. Very high catalog value! 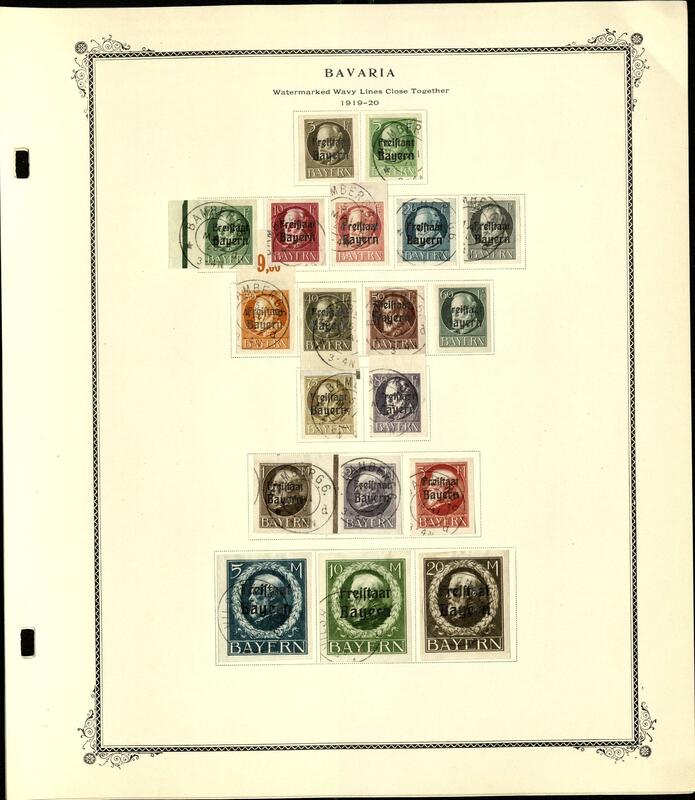 2246 ⊙/ / Bavaria - rich collection in a large stockbook, mainly used collected, sometimes with several shades of colour and different cancellations. As well an extensive part Kreuzer period with better values, margin copies, 12 and 18 Kr. Values, with also 18 Kr. Red five times, extensive part coat of arms issues, as well the Pfennig period extensively covered including service- and postage due stamps, mixed quality, with much perfect material and enormous catalogue value! 2402 Kart⊙n Bavaria - interesting and extensive inventory packed in a carton with numerous issues the Kreuzer and Pfennig period, as well numerous issues in bags, on stock cards, album pages and so on. Including complete sheets and parts of sheets. Huge number of pieces and treasure trove, there unchecked for plate errors, colours and so on. 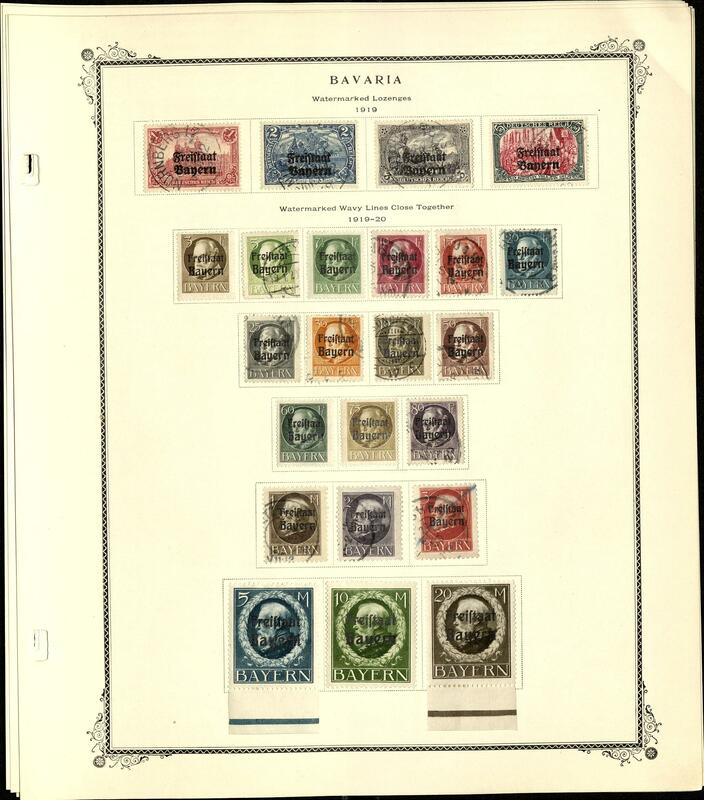 2521 ⊙/ / /✉ Bavaria - huge inventory from issues the Pfennig period in two large thick stock books formed and chronologically sorted. 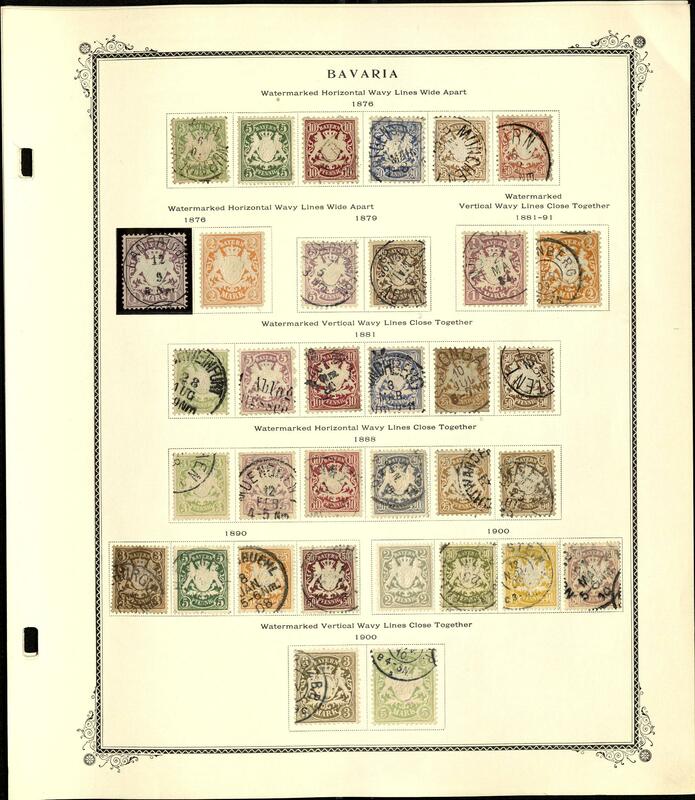 As well enormous amount of material, frequently close one above the other puted including better values, colors, shades, numerous complete sets, an extensive part coat of arms issues, the King Ludwig stamps very extensively present and so on. Favorable valued inventory with a gigantic amount of material and enormous catalogue value! 1623 ⊙ Belarus - 1992 / 2010, very nice used collection, complete with all issued stamps in two Schaubek hingeless illustrated albums. As well all appeared sets and souvenir sheets. Additional are as well numerous miniature sheet included. A magnificent object! 347 x Belgium - extensive inventory packed in a carton. 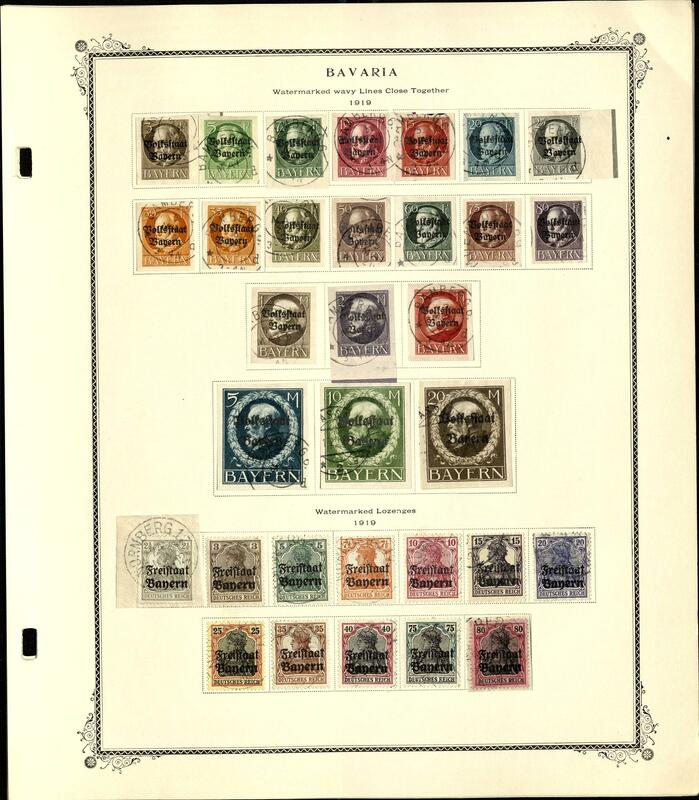 As well issues mounted on pages with older values, much material on stock cards, numerous covers and so on. Treasure trove! 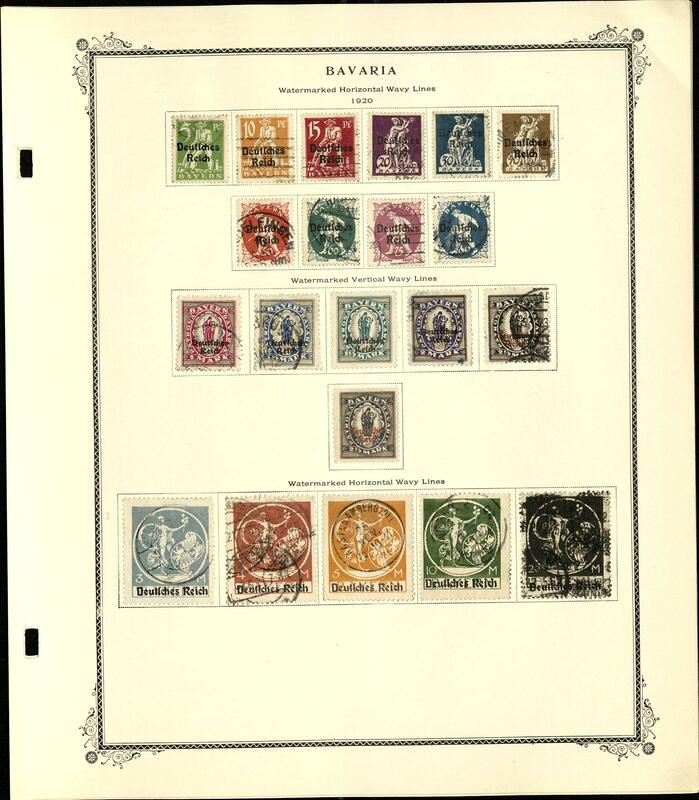 452 x Belgium - extensive lot packed in a carton with numerous issues in stock books, on stock cards and so on, from the classic, with also numerous special- and commemorative issues and so on. Treasure trove! 472 Belgium / nominal - very nice and assorted lot of post valid mint never hinged issues in covers to in each case 100,- Euro prepackaged, many nice motives, souvenir sheets and so on. The pure face value amounts exactly 1600,- €. 575 ⊙/ / Belgium - extensive collection from the classic formed to 1990 in a large thick stockbook with lots of material. With numerous older issues, special- and commemorative values, Orval, numerous issues from the thirties and forties years, as well much post-war period. Very high catalog value! 623 Belgium - 1983 / 98, very nice mint never hinged collection, nearly complete in the Schaubek hingeless illustrated album. All issues are still postally valid and the nominal amounts 12480,- belgian franc, what converted over 300,- €corresponds. A beautiful object! 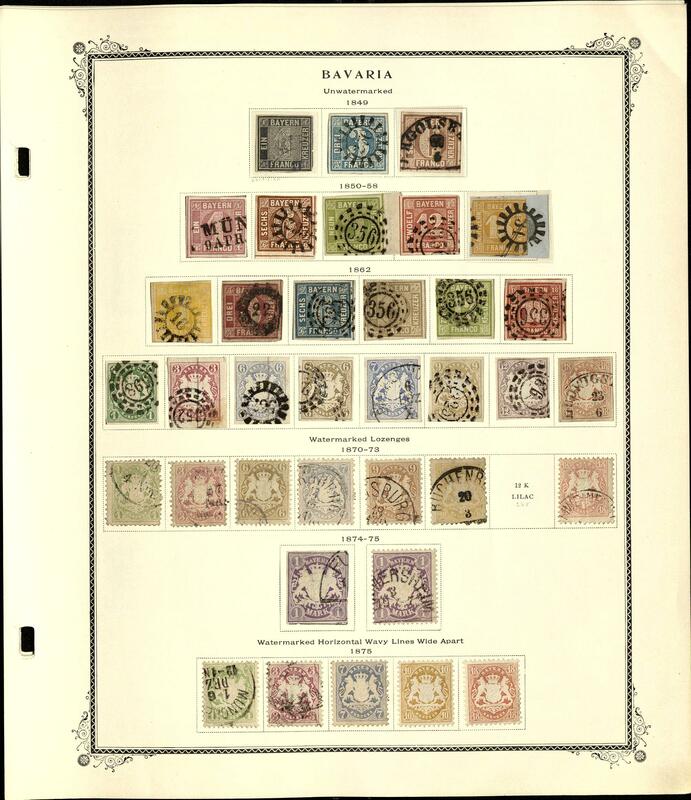 876 /⊙/ Belgium - extensive inventory from the classic formed in six beautiful safe ring binder with an enormous amount of material, with also souvenir sheets from the forties years, numerous special- and commemorative issues and so on. Huge catalogue value and original price the albums already approximate 600,- €.